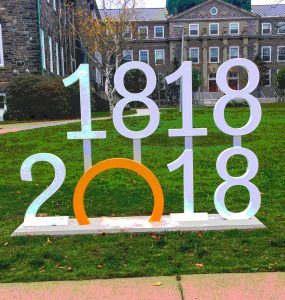 Dalhousie is celebrating 200 years, a significant milestone that allows us to pause for a moment and reflect on our past even as we look forward to the opportunities that await us in the coming decades. Today, CEGE Connection takes a brief look back to the year 1818, the events and happenings that were in motion when Dalhousie University was founded by General George Ramsay, 9th Earl of Dalhousie. Frederick Douglas (February 14), Karl Marx (May 5) and Emily Brontë (July 30). In Canada, Élisabeth Bruyère (March 9), the founder of the Sisters of Charity of Bytown (former name of Ottawa, Ontario) who would open the first hospital and first bilingual school in Ontario. Frankenstein, by Mary Shelly published anonymously. Percy Bysshe Shelley’s poem, Ozymandias, published. Jane Austen’s novels, Northanger Abbey and Persuasion, published (posthumous). Felix Mendelssohn performs his first concert in Berlin. He is 9 years old. First known Christmas carol (“Silent Night, Holy Night” – “Stille Nacht, Heilige Nacht) performed in Austria, December 25th. Halifax and St. John’s are made free ports. 49th parallel becomes British North America/U.S. border. Netherlands & Britain sign treaty against illegal slave handling. Two English boxers are first to use padded gloves. Chile issues an official declaration of independence from Spain. In Japan, Emperor Meiji’s far-reaching social, political and economic changes are underway. In China, Qing Dynasty is in power. King Shaka of the Zulus is in ascendency and prepares to establish a centralized Zulu kingdom. The first Mill of Cotton clothes opens in Kolkata (Calcutta). General George Ramsay, 9th Earl of Dalhousie, Lieutenant-Governor of Nova Scotia founds Dalhousie University in Halifax, Nova Scotia. Lord Dalhousie is convinced that the Edinburgh model – a liberal, nondenominational, classless college – is optimal, based on his personal experience attending the University of Edinburgh where he studied with a young Walter Scott. February 16, 1818 marks the day that Lord Dalhousie receives the royal approval via Lord Bathurst. Dalhousie came into being in 1818, but there is much more to the narrative. We invite you to view DAL 200 Timeline to explore Dalhousie’s inspiring history!